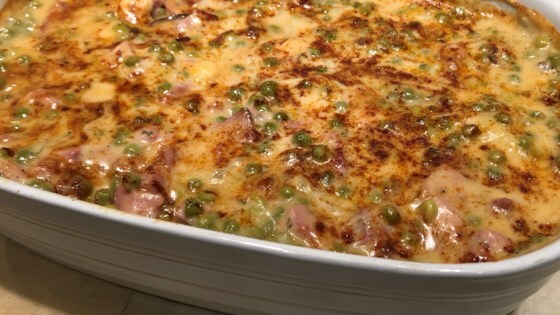 "Creamy sauce with a mild cheese flavor baked in with ham and peas. This recipe is really easy and I have never had anyone not like it. Plus it's affordable." Layer half the potatoes, half the ham, and half the onion in an 2-quart baking dish; repeat the layers. Heat milk, peas, flour, butter, salt, black pepper, garlic powder, and onion powder in a saucepan over medium heat, stirring constantly, until thickened, 7 to 10 minutes. Stir Cheddar cheese into sauce until cheese is melted. Pour sauce over potato and ham mixture; sprinkle with paprika. Bake in the preheated oven until potatoes are tender, about 1 hour. Remove foil and continue baking until lightly browned, about 15 minutes more. This is a great recipe- I didn't change a thing. I'm so glad to find one that doesn't include a cream of _____ soup in the ingredient list. Thanks for sharing this, Suz!